I spent the early part of the day at the Books not Bombs action with about 250 others and then went home to watch President Obama’s speech at James C. Wright Middle School in Madison on television (transcript, here). Here are some reactions. The inspirational message, especially the words directed at students and parents was very good. He was utterly right about the need to seize opportunities, value and support leaning and the importance teachers and parents working to have children internalize pride in academic achievement. One of the best teachers my children have had moved our son from racing to get his work done as fast as possible to completing assignments in a way that he could be proud of. Thanks Mr. Waters and thanks President Obama for this message. He was also very good about the need to make education central to our national agenda. A little too much about the economic aspects and too little about building an engaged citizenry for my taste, but good to hear. As many speakers at the Books not Bombs made clear, this is not happening and as I observed in an earlier post the desperation of states for Race to the Top funds is ample evidence that we are not investing in education as we should. This raises a basic contradiction between the rhetoric in the policies: If education is as essential to our nation’s present strength and future well being as President Obama says it is, why must states compete for one-time grants to fund only a portion of the needed investments? What about the states that don’t get grants, are their futures less crucial, are their children less deserving of educational opportunities.? If we can spend $4 billion a week to keep the military in distant countries we should be able to fully fund the education of every child in every state. When we spend billions on bombs, we shouldn’t have to ask for Pennies for Kids. There were also some contradictions within the four core ideas behind Race to the Top that the President delineated. Again, he was absolutely correct about the need for better assessments (I have doubts about the role of national standards in this process, but that is another issue), however Race to the Top is built expanded use of the inadequate assessments we have now. Linking teacher pay to flawed tests doesn’t make sense. Let’s work to create real, balanced and useful assessments first and then discuss what we should do with them. Prioritizing data collection has similar problems. We can have the best system for collecting and analyzing data, but if the data is bad to begin with, what is the point? The old computer programmer phrase comes to mind: Garbage In, Garbage Out. Obama is right that our current state assessments are near garbage; I just don’t understand how he can know that and still want to expand their use as the basis for decision-making. It also bothered me that the President seemed to paint a picture of teacher’s currently making no use of assessments or feedback in shaping their teaching. Every teacher uses many forms of feedback everyday; they see the looks on children’s faces and change their mode of explanation or offer words of encouragement; they grade homework and know what they did well and what they need to do differently; they evaluate exams and decide how to move forward. This is basic to teaching and happened long before there was any talk of standardized tests and longitudinal data systems and will continue to happen whether the Race to the Top agenda is enacted or not. 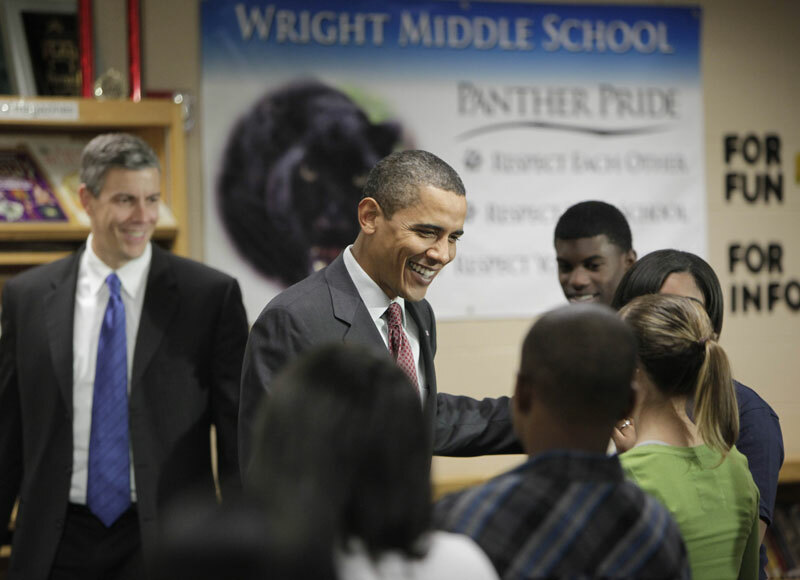 President Obama is also correct about the need to attract to and keep the best in our classrooms. My opinion is that the way to do this is to respect them as professionals, listen to them and not dictate reforms from above. Recognize that perhaps the teacher who spends hours with students every day might have a better grasp of what is needed and a deeper understanding student progress than anything that will show up in a Value Added Analysis. It isn’t that I think the data and analysis is useless, it is that I fear that by elevating data above humans we will shut our ears to those whose voices need to be heard and we will make teaching a less attractive vocation. I’m looking for a better balance. Secretary of Education Arne Duncan presided over the closing of dozens of failing schools when he was chief executive of the Chicago public schools from 2001 until last December. In his new post, he has drawn on those experiences, putting school turnaround efforts at the center of the nation’s education reform agenda. Now a study by researchers at the University of Chicago concludes that most students in schools that closed in the first five years of Mr. Duncan’s tenure in Chicago saw little benefit. “Most students who transferred out of closing schools re-enrolled in schools that were academically weak,” says the report, which was done by the university’s Consortium on Chicago School Research. Furthermore, the disruptions of routines in schools scheduled to be closed appeared to hurt student learning in the months after the closing was announced, the researchers found. There is much more of interest on “turnarounds” in this week’s National Journal experts blog. On this and many other aspects of Race to the Top, from linking teacher pay to test scores to charter school expansion, solid research often contradicts the claims of this administration. At best the jury is still out on the reforms they are pushing; at worst the evidence is that enacting much of their program will make things worse. I share the President’s desire for every child to have access to full and rich educational opportunities, to move the United States toward a culture that values teaching and learning. I worry his plan for making this happen will move us further from realizing these ideals. Time to go help our younger son with his homework. Thank you TJ for the review of the President’s comments. I am pleased that the students at Wright Middle School had this opportunity to be up-close-and-personal with a great role model, and on the topic of education. But I have to agree that I am disappointed with the approach of one-time grants, and winners and losers in the process. Is there a state that doesn’t need funding to help reverse the trend from “race to the bottom” to “race to the top”? What we really need is a complete change in attitude about the importance of education. Penny’s for Kids – yes, that is what we are doing, and what cost to our national and global interests. Thank you for your analysis. My wife, a former director of instruction at a medium sized school district said research shows the best correlation between student achievement and most everything else is the education level of the mother. The higher that level is the better the kids perform in school. My Obama said we have to get rid of the bad teachers. I resent that right wing radio talk attitude his comments exemplify. Here is a man who has the power to investigate and prosecute the corrupt leaders of the banking and insurance industries and HE DOES NOT DO IT. These bad, corrupt managers caused tremendous financial losses, tremendous pain and sorrow for the 15 plus million persons who lost their jobs and their families. Each of these corrupt managers had a fiduciary responsibility to their stockholders and they made a personal fast buck instead. They have legal responsibility for their financial statements and they broke the law by lying. Mr. Obama has directed no legal investigations be conducted by the US Attorney General Holder. Mr. Obama prevents legal investigations and prosecutions of Mr. Bush and Mr. Cheney for wars crimes e.g. setting up a world wide system for torture, conducting illegal wars of aggression, etc. And he has the nerve to say that we need to get rid of poor performing teachers as if 50% of the teachers in the United States are under performing teachers. Under present law, teachers are to be evaluated, disciplined if needed, brought up to a better level of performance, suspended or fired by principals. Principals in our public school systems are usually far over worked and have little time to devote to supervising 30 to 100 teachers. The management and the effort to improve teacher performance has never been set up in the large consolidate schools systems since the 1950’s. The concepts teacher unions have offered, such as, mentoring programs for new teachers, mentoring/performance improvement programs for tenured teachers who are having difficulties, the establishment of a master teacher track or a teacher leader track, etc. have never or seldom been designed, approved, funded and implemented. The concepts of paying superior or master teachers under a union contract, has I believe been offered, but school boards and management seldom agree because they do not want to admit the present system of failed non-management by principals doesn’t work. Obama needs to lead by example not by rhetoric. He needs to live up to his oath to support and defend the Constitution of the United State of America. He needs to prosecute major alleged politically powerful criminals to the fullest extent of his power before he can tell others about improving their performance.